It's an MFT VIP Blog Hop! Well, it's Berry nice to see ya'll here again, only this time we are hoppin' on the MFT VIP train! Yes, it's already VIP time and we are celebrating with a blog hop to show off the new upcoming Who's That Girl set ya'll are going to need from My Favorite Things. 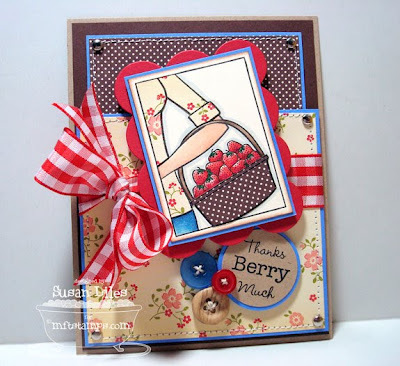 If you just popped in here to see how I was doing, thanks Berry much, but just for grins, sit back, relax and start at the beginning of the hop over on Kim's blog to reap the best harvest of eye candy. What's an MFT VIP you ask? It is a ONE DAY ONLY product (which will be available tonight at 10 PM EST through July 21st at 11:59 PM EST). What's so cool about that? Ya'll have the opportunity to purchase the WTG set TWO WEEKS early so you can start playing with it before its actual release date! BERRY SWEET! So let's talk about my card, here, ok? I never use blue. I take that back, I love using light blue and I can't seem to put down the aqua blue (I almost swapped it out for the aqua several times in the making of this one. Then I said, "Susan, just put down the aqua."). It's just this regular everyday beautiful blue that I never go for. Why? You tell me. So I forced myself to go for it this time and I really like the quiet touches of true-blue. Do ya'll? Anyway, I colored the non-paper-pieced areas of the WTG stamp, Who's That Harvest Girl? with my Prismacolor Pencils and Odorless Mineral Spirits (I had so much fun with the last one I did!). I added some MFT Ribbon and Buttons from the Summer and Earth Girl Collections that I LOVE! This WTG set is my new favorite. I've decided that this card sort of reminds me of a Better Homes and Gardens summer magazine cover! 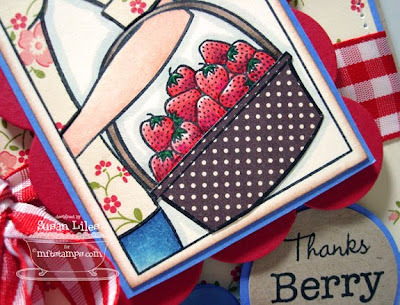 Ok, thanks Berry Much for stopping by, but now it's time to head on over to the coloring queen, Sherrie Siemens' blog!! Have fun! So cute, Susan! Love how bright and cheerful it is! Gorgeous! Love the true blue! I hope you get to feeling better! So sorry you are sick, but you made an absolutely adorable card! I have to say the true blue works perfectly! So glad you went with it and your paper piecing is amazing! So cute and inspiring! You are just so cute I love reading your stories on how or why you do what you do. I love the blue it looks awesome, the whole card looks awesome you are such an inspiration. Take care of your self and thanks for sharing. Oh no, I'm so sorry to hear that you are not feeling weel! You're card is stunning, and I love how you added the blue! Thanks for the tip ;) I was begining to worry about how many times I would have to stamp in order to get it right! lol! Will you look at this beautiful card. Oh, I love the paper pieced. I love your splash of papers. Makes me want to have a picnic. Great card! Love the buttons on the card. Great ideas and thank you for sharing. Your projects are always a joy to come see! And the tips are most helpful too! Sooo pretty, Susan! I love that tiny flower print top! GREAT paper combo! bright, happy and yummmy! gorgeous card, Susie. I love your card!!! The colors, the image, the overall layout!!! Love it Susan! the image looks fabulous on a tilt like that! Loving those Earth Girl buttons and the Perfect Plaid ribbon! I'm with you on the blue, I never seem to use that shade either! GORGEOUS Sue!!! LOVE the layout and papers on this!!! Just BEAUTIFUL!! Such a cute card. I am loving the diversity of this stamp set. Love how cheery this is Susan and that you echoed that polkadot paper in the basket from the background! True blue is truly beautiful! :-D Great card, and I adore that paper you picked to paper piece with--love the vintage look it has. Get well soon! That is REALLY gorgeous. WOW! That coloring, the color combo... WOW! GORGEOUS! SOOOOO cute!! Great colors, and...well, it's all amazing! !